4 Stacking Chairs 23Wx23Dx36H. Seat Dimensions:16.5Wx17Dx18H. Relax in style with these comfortable dining chairs from CorLiving. The sleek lines and powder coated aluminum frame of the PJR-572-C chair create an elegant look, while the wide slat surface offers a comfortable seat. Constructed from durable engineered polymer material, these chairs have the appearance of bleached wood without the necessary upkeep and are UV resistant which prevents discoloration. This 4pc set is expertly constructed to withstand a range of climates. Home Styles Biscayne Arm Chair is constructed of cast aluminum with a black finish. Features include powder coat finish sealed with a clear coat to protect finish, and nylon glides on all legs. Chairs are packed two per carton. Item Size: 22.83w 21.65d 32.68h Seat height 15.5h. Stainless steel hardware. The Bora arm chairs in celeste are commercial outdoor dining chairs with arms. They are a fantastic edition to any restaurant, patio, indoor/outdoor community pool, or back yard setting. The stylish Italian made chairs are stackable with replaceable non-slip feet. They will not fade, peel or rust. They are designed to last for years and withstand constant use. They are ergonomically designed for maximum comfort. 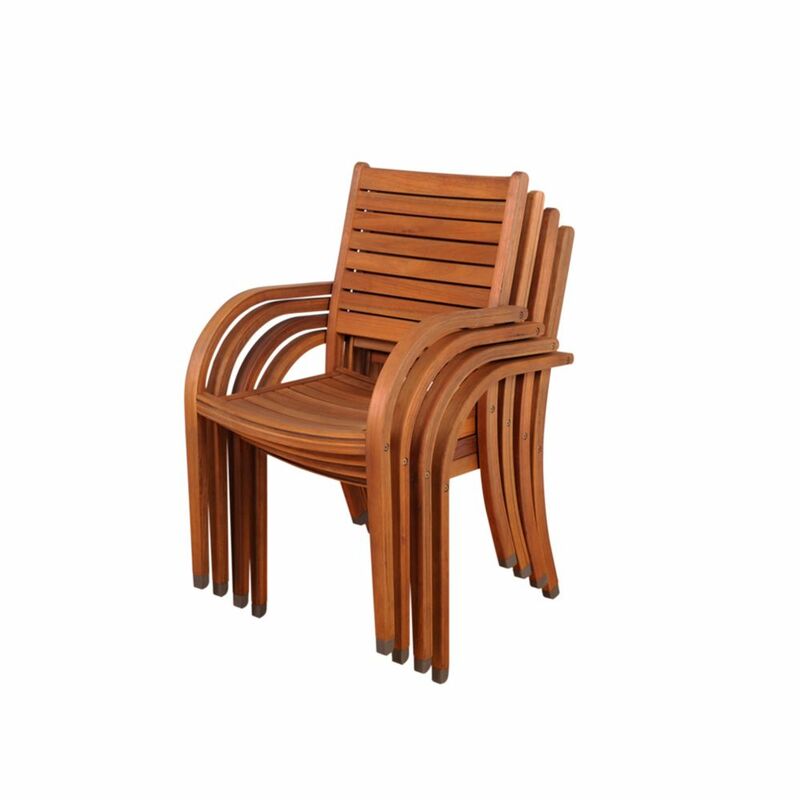 Arizona Stacking Patio Arm Chair (4-Set) The Amazonia Collection is committed to providing premium quality sets with an elegant design that will make your home stand out above the rest. Crafted from solid Eucalyptus Grandis wood, grown in 100% managed forests in Brazil and certified by the FSC (Forest Stewardship Council), this eucalyptus furniture is known for its longevity and craftsmanship at an affordable price. Enjoy your patio in style with these great sets from our Amazonia Collection. Arizona Stacking Patio Arm Chair (4-Set) is rated 4.0 out of 5 by 1. Rated 4 out of 5 by Lagunatic from Nice looking, need pads The chairs are very well made and look wonderful, BUT...they are uncomfortable and definitely need chair pads! They sit slightly higher than most dining chairs.